Lancashire's history in the ninth and tenth centuries is very murky, and it is generally assumed that the region around Liverpool was part of the Scandinavian kingdom of York. Now a genetic study of men living in the area may be able to back up that assumption, claiming that the Liverpool area was once a major Viking settlement. The research was carried out by Professor Stephen Harding of the University of Nottingham and a team from the University of Leicester led by Professor Mark Jobling. They picked up on Viking ancestry in Liverpool's present inhabitants by focusing on people whose surnames were recorded in the area before the city's population underwent a huge expansion during the industrial revolution. Among men with local, pre-industrial surnames, half were found to have Norse ancestry. 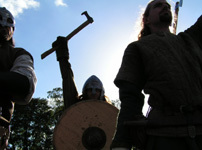 The find backs up historical evidence from place name studies, and archaeological finds of Viking treasure, which suggests significant numbers of Norwegian Vikings settled in the north-west in the tenth century, while the Scandinavian kingdom of York (presumably) ruled the region. "[The genetics] is very exciting because it ties in with the other evidence from the area," said Professor Stephen Harding. The team used historical documents, including a tax register from Henry VIII's court in the sixteenth century, to identify surnames which are common in the region. They then recruited 77 male volunteers with local surnames, and looked for a genetic signature of Viking ancestry on the Y chromosome. They report in Molecular Biology and Evolution that a Y chromosome type, R1a, which is common in Norway, is also very common among men with these local surnames. In around AD 900 longboats from Norway sailed down the River Mersey. The 'Vikings' who arrived founded or occupied many settlements in the area, which can be seen in local place names, such as Aigburth, Thingwall, Formby, Crosby, Toxteth, and Croxteth. The biggest of the Viking settlements was probably in West Derby - the name roughly meaning Wild Deer Park. The city of Liverpool itself began as a tidal pool next to the Mersey which was probably called the 'lifer pol', meaning muddy pool. Although there may have been a hamlet in the area (and on the above evidence, a hamlet which probably consisted of a large number of Viking descendants), the town of Liverpool was not founded until King John needed a port from which to easily reach his newly conquered lands in Ireland in 1207.